The U.S. is not the underdog in a lot of things. It is in hockey. Always has been, maybe always will be. The fact that Canada, our closest neighbor, is where the sport takes hold most fiercely leaves those of us in the U.S. that love the game in a position other sports fans are not. There’s no doubt there’s an inferiority complex among American hockey fans when it comes to international hockey. With Canada’s historic dominance of the game internationally, it’s easy to feel a little jealous. History has begun to change, with the U.S. coming oh so close in Vancouver and its improved play internationally at the younger levels of hockey. More NHLers are coming from these United States and a lot of them are quite good. But there will always be that measuring stick. One fan has played into that mentality with this fantastic video ahead of USA-Canada games in women’s and men’s hockey. YouTube user Jamie Winterstern uploaded this video on Feb. 18 with a poem entitled “Dear Canada.” If you’re an American hockey fan, you’re going to have some strong reactions here. Here’s the text of the poem that is read over scenes from the many rinks of Minnesota. Now unless you’re a snarky internet person who rolls his or her eyes at everything or not American, maybe you got chills after watching that. It’s really well done. A simple note, not one that disparages USA’s greatest hockey rival, but shows respect. There’s also that hint of defiance. It is time once again for the U.S. to prove itself against its biggest rival. Much will be put in these games and probably too much from the outside trying to pull meaning from one game. This video, however, probably speaks to a lot of American hockey fans. It is a bit of a rallying cry for those Americans who want to express that hockey belongs to them as much as it does anyone else. But I think it even goes beyond that. Those that are fans of the game come from all over the world and their love is as fierce and as passionate as anyone’s. I think that’s why this video struck me so much. Everyone’s love of the game is the same and that’s why even when the colors of different teams and countries divide us, we are all boiled down to one overwhelming commonality. We love hockey. It is our game, everyone’s game. And it’s a wonderful game. This is a great rivalry. And these next two days are going to be a lot of fun. Like everyday, it’s a great day for hockey. This entry was posted in 2014 Olympics, NHL, U.S. National Teams, USA Hockey, Women's Hockey. Bookmark the permalink. 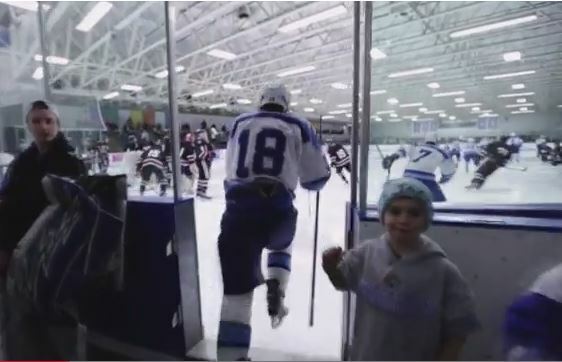 As a former player turned hockey dad and coach…and as someone who watched his 7- and 2-year-old stand by an open door and high five our local high school team last Saturday during an afternoon win…yes. Everything about this video…yes. We are the ones with heals dug in. Very well done. I’ve been waiting for someone to come along with their own version and with only a few hours before the gold medal game, you’ve provided me one! I am so touched that so many people have reacted positively to the video. Not many people know this, but I was born and raise in Montreal and am a huge Canadiens fan. I created this poem because I am currently in development on a hockey movie featuring these young brave boys from Minnesota, Friday Night Lights on ice if you will. As a Canadian living in the USA, I love to see the growing enthusiasm for the game of hockey here. If it wasn’t for this ongoing hockey rivalry between these two great countries, it wouldn’t be nearly as fun. Here is my video response to Jamie Winterstern’s “Dear Canada”.